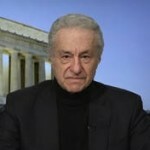 Historian Gar Alperovitz has revealed for the first time the key role he and a handful of other activists played in helping whistleblower Daniel Ellsberg leak to journalists the Pentagon Papers—a 7,000-page classified history outlining the true extent of U.S. involvement in Vietnam. Historian Gar Alperovitz has revealed for the first time the key role he and a handful of other activists played in helping whistleblower Daniel Ellsberg leak to journalists the Pentagon Papers—a 7,000-page classified history outlining the true extent of U.S. involvement in Vietnam. Daniel Ellsberg told The New Yorker the secret role this group played was so crucial in releasing the Pentagon Papers that he gave them a code name: “The Lavender Hill Mob.” Alperovitz went by the alias “Mr. Boston.” Ellsberg told The New Yorker, “Gar took care of all the cloak-and-dagger stuff.” We speak to historian and political economist Gar Alperovitz about why he is going public now. As President Trump continues his crackdown on immigrant communities, a growing number of people are taking sanctuary in churches across the country to avoid deportation. A new report called “Sanctuary in the Age of Trump” says more people are now taking sanctuary than at any time in the United States since the 1980s. Another immigrant rights leader, Sandra Lopez, has taken sanctuary at the parsonage of the Two Rivers Unitarian Universalist church in Carbondale, Colorado. She is now facing deportation to Mexico after living in Colorado for 17 years. She’s a mother of three U.S.-born children: Alex, Edwin and Areli.